Sadly not. This advertising slogan was used back in the days when companies could attach any kind of health benefit they liked to their products without being investigated. Most people associate Guinness with a high iron content, and although draft Guinness does contain some goodness from the barley, hops and yeast, it’s unfortunately nowhere near close to significantly contributing to the RDA (Recommended Daily Allowance) of any of your essential vitamins and minerals. 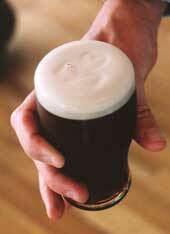 A pint of the Black Stuff contains 0.3mg of iron. The RDA of iron for men is 8.7 mg a day and for women 14.8 mg. So men, you would need to drink 29 pints and women 49 pints before you reach your daily allowance - your iron levels would probably be the least of your worries at this point. Incidentally, red wine contains more iron per 100 ml than Guinness, although still not enough to safely drink your RDA in a night! If you’re watching your weight, there’s 210 calories in a pint (it’ll take about a 2 mile jog to burn this off), which isn’t too bad, especially as you’ll burn off a few standing at the bar waiting the 119.5 seconds it takes to pour the perfect pint! I hope you enjoy sharing these myth-busting pearls of wisdom in the pub tonight.